Monotropa uniflora (ma-not-ra-pa: flowers turned one way, a meaningless name for a one-flowered plant; you-nif-lor-a: one-flowered). 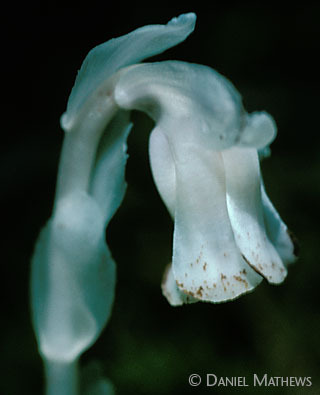 Synonym: Monotropastrum uniflora. Plant entirely lacking green parts, fleshy, white or pink-tinged, drying black; lobes and stamens usually 5, sometimes 4 or 6; flower single, narrowly bell-shaped, ½–¾” long [12–20 mm], pendent, but erect in fruit—a soft round capsule; leaves translucent, small; stems densely clustered, 2–10″ tall [5-25 cm]. Habitat: Dense forest; all but WY. Natural History: A strange plant, but a familiar one all across the continent. 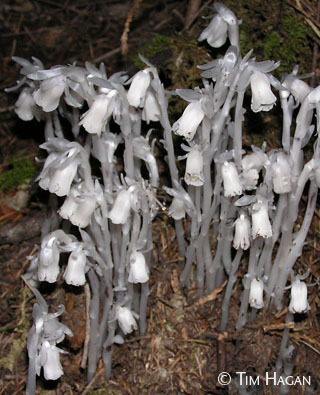 Don’t pick Indian pipes—they’ll just turn black and ugly within hours. Some of our most intriguing herbs have no chlorophyll, and obtain all their nutrients from fungi. Since chlorophyll is the green pigment in plants, these plants are not green. They were long called “saprophytes,” meaning that they obtain their carbohydrates from dead organic material, but that isn’t what they do. Their carbohydrates come from living green plants via living mycorrhizal fungi which pass them along to the non-green plants belowground. The mycorrhizal symbiosis must have evolved because it lets fungi and plants utilize each other’s strengths—the fungus’s efficient uptake of water, phosphorus, and nitrogen, and the plant’s ability to make carbohydrates out of air, water, and sunlight. Some mycorrhizal plants, it seems, gradually contributed less and less to this exchange, and got away with cheating as long as there were other plants feeding the same fungus. As the cheaters evolved, organs they no longer needed atrophied. They ended up with vestigial leaves, little or no chlorophyll, and no real roots—nothing but a stalk of flowers reproducing, while using the trees above for leaves and the fungi below for roots. Proof of whether this symbiosis is mutualistic or parasitic has resisted most efforts, so far. Non-green plants do produce chemicals that some researchers call “vitamin-like” because they stimulate growth of both the fungal and green hosts. But that doesn’t prove beneficence: parasites like mistletoe commonly stimulate growth in their hosts, but that saps the hosts, it doesn’t energize them. Mushrooms in the Russula family are the usual cosymbiont of Indian Pipe, and Douglas-fir is often at the far end of the pipeline. This article and photos are adapted from Northwest Mountain Wildflowers, an app for iPhone and iPod.